Testimonials like that certainly speak for themselves, but the TechValidate study (TVID: CEB-49D-467) probed a bit deeper into the company’s experience to confirm yet another compelling PrinterLogic success story. In the case of this S&P 500 healthcare company, TechValidate found that the organization is already seeing ROI of more than 200% after installing PrinterLogic. In fact, PrinterLogic fully paid for itself in just one year. What issues was this S&P 500 healthcare company looking to address with PrinterLogic as its enterprise print management solution? Common ones, such as centralizing and streamlining management of printers, queues and drivers. It wanted to cut down on its servers and to be able to deploy printers easily without having to resort to custom scripts and group policy objects (GPOs). But even though these issues might be common, the company’s print environment was all its own. 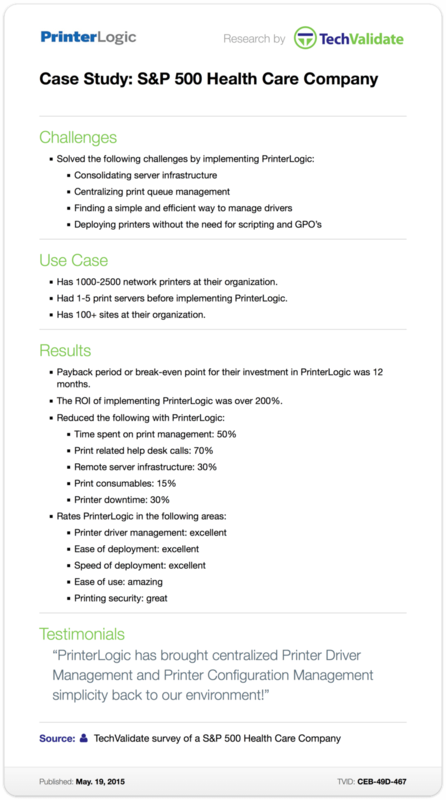 PrinterLogic had to be robust and versatile enough to adapt to an infrastructure that initially consisted of over 1,000 networked printers, a handful of print servers, and more than 100 physical locations. Those reductions have translated into huge cost, time, and resource savings both in the short-term and the long run. Which probably explains that impressive (and ever-increasing) ROI. It also explains why, when asked for subjective evaluations of PrinterLogic’s performance, this S&P 500 healthcare company didn’t hold back on the superlatives. It rated PrinterLogic as “excellent” in the areas of printer driver management as well as ease and speed of deployment, “amazing” in terms of ease of use, and “great” when it came to printing security.